With equities seeing a complete failure of the morning gains, the VIX broke higher in the afternoon, settling +4.9% @ 20.56 (intra high 21.58). 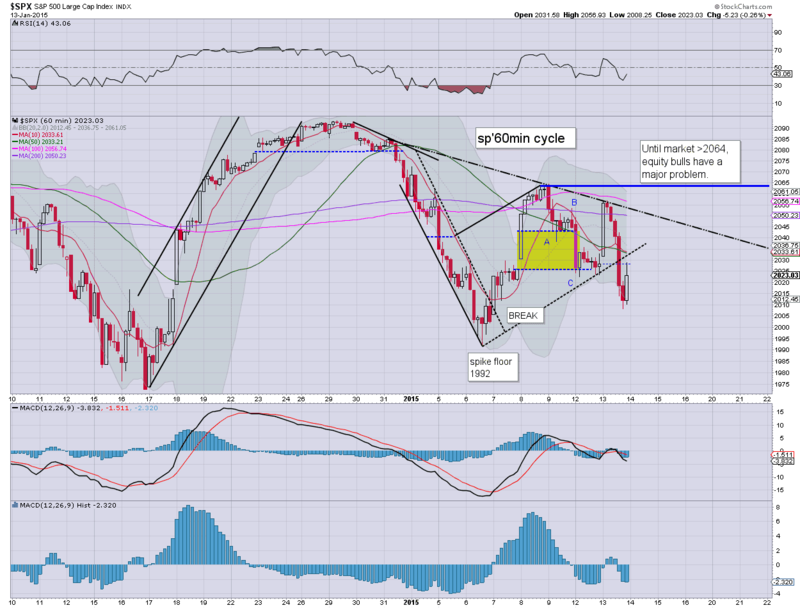 Near term outlook is uncertain, not least with equities threatening a wave lower to the 200dma of sp'1965. A pretty wild day for the US equity market, and in some respects, its almost surprising the VIX did not explode faster.. and higher. In any case.. another break above key 20 threshold. 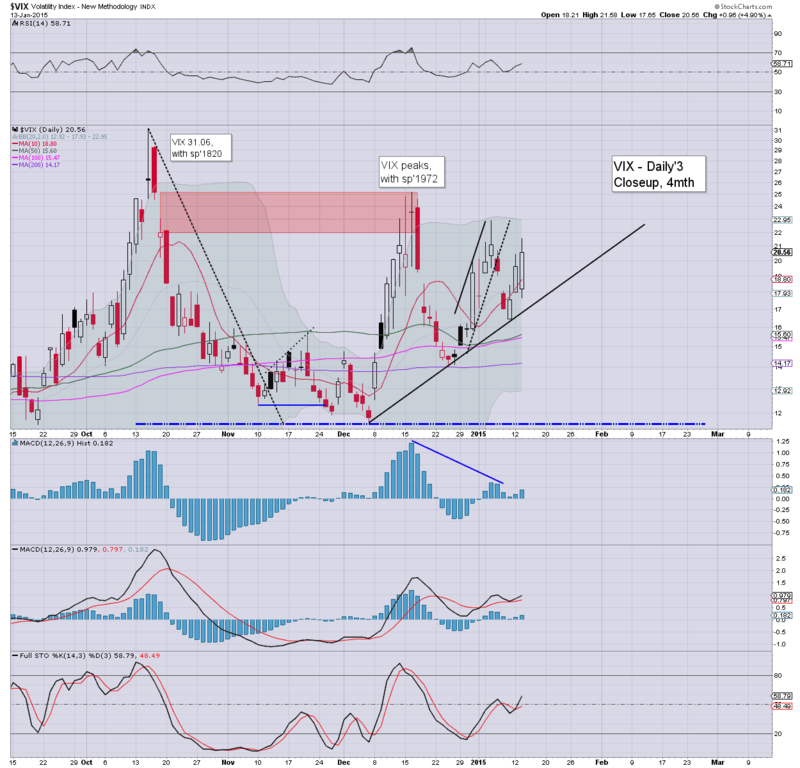 Whether the VIX will continue climbing into the mid 20s.. difficult to say. US equities saw one of the strongest intraday swings in some years. The sp'500 swung from a morning high of 2056... breaking lower to 2008 @ 2.30pm.... clawing higher into the close, settling -5pts @ 2023. The two leaders - Trans/R2K, settled -0.5% and u/c respectively. 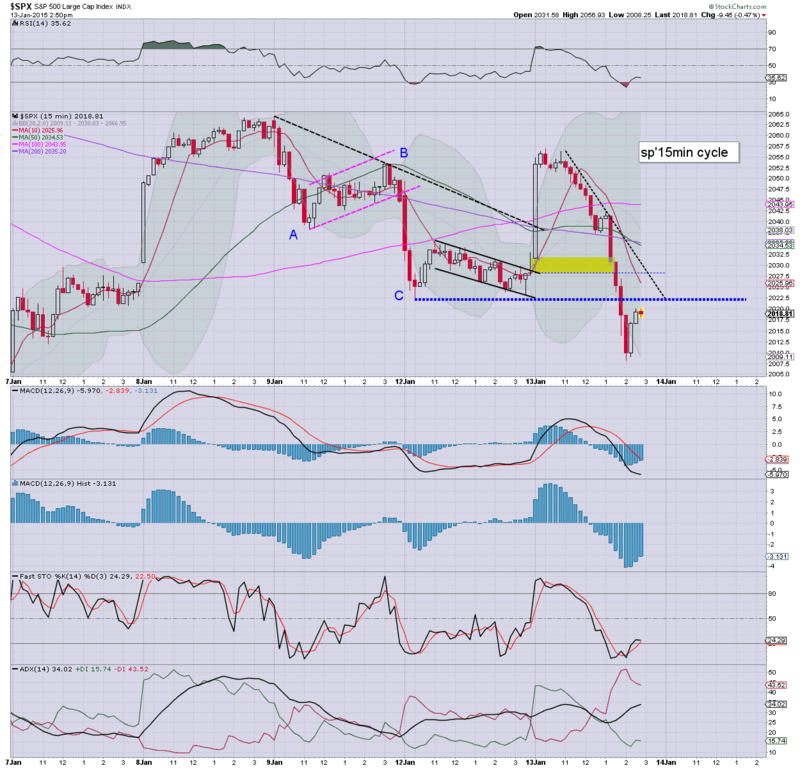 *a fractional net gain for the R2K, but still... that was one nasty drop from the earlier high of 1200. ... without question.... the opening gains were no surprise... but the utter failure of them were. It was one hell of a day in market land... and price action is now leaning bearish. Price structure is something of a mess. The one thing bulls still have is that the rising trend - seen on daily charts, is just about holding. 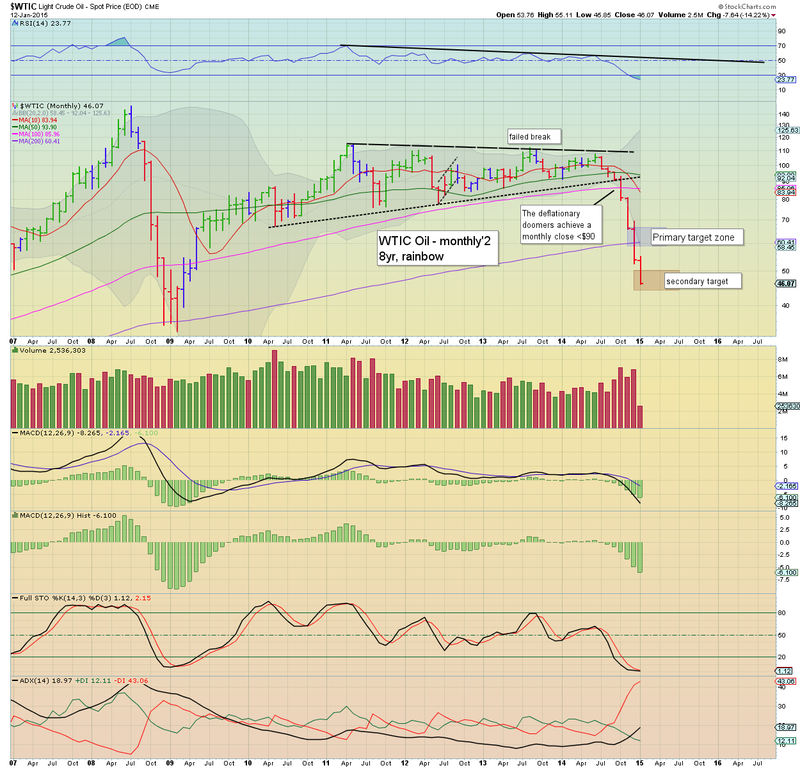 Any break under today's low of 2008, would bode for a move lower to the 200dma... in the mid 1960s. Regardless of where the market closes, it has been one crazy day in market land. After stronger than expected opening gains to sp'2056.. we've seen the strongest intra-day swing since Nov'2008 (according to clown finance TV). After today's price action... near term outlook is now very uncertain. *seen on the daily chart, today's candle illustrates a major fail for the bull maniacs. Even if the market closes in the sp'2030s (which won't be easy).. the spiky candle does not bode well for the bulls. We're just about holding the rising lower trend... but its marginal... 'at best'. Notable weakness, Copper, -5%.. with a new multi-year low of $2.58. 3.14pm... chop chop... just above the low.. sp'2012 with VIX 21s. Clearly, anyone short is getting the opportunity to exit... price action remains BEARISH in the immediate term. Arguably... until we take out the Fri' high of 2064... outlook remains uncertain. 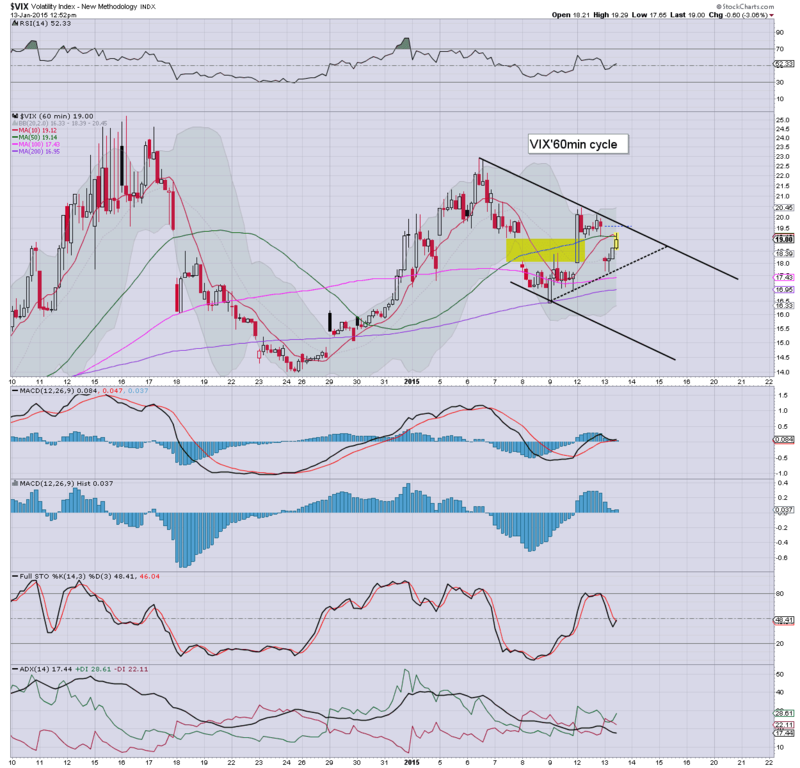 3.19pm.. sp'2019.... VIX cooling... but regardless... the technical damage has been done. Real carnage in the copper market today... finally starting to 'catch-down' to Oil.. you might say. 3.35pm.. Bears starting to close out... sp'2021.. .VIX still holding the 20 threshold though. Regardless.. a massive intra-day swing.... major bull FAIL. 3.38pm.. HUGE short-stop cascade underway... sp'2024.... the 2030s are still viable by the close... not that it negates the earlier FAIL. 3.40pm.. HYPER ramp underway... bears on the run.... this is one WILD CRAZY day. VIX set to close red. 3.45pm... Smaller 15min cycle set to get a bullish cross into the close... bodes for 2040/50s tomorrow morning. 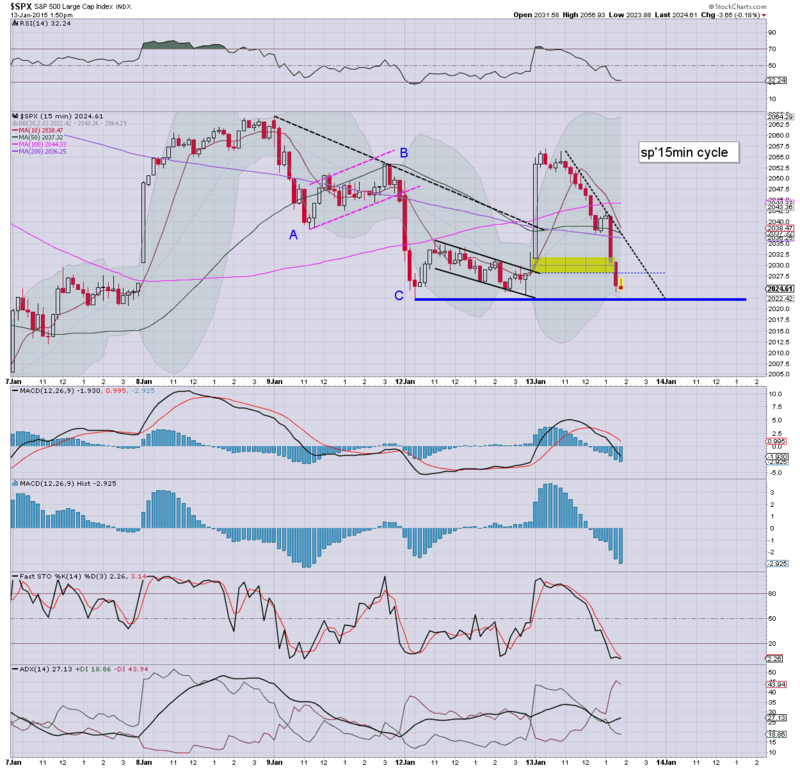 3.52pm.. renewed weakness... market trying to get a close above the broken low of sp'2022... now looking unlikely. The earlier high of sp'2056 is now a long way up.. after the market has seen the gains completely fail. The sp'500 and R2K have already turned red... along with a positive VIX back in the 20s. 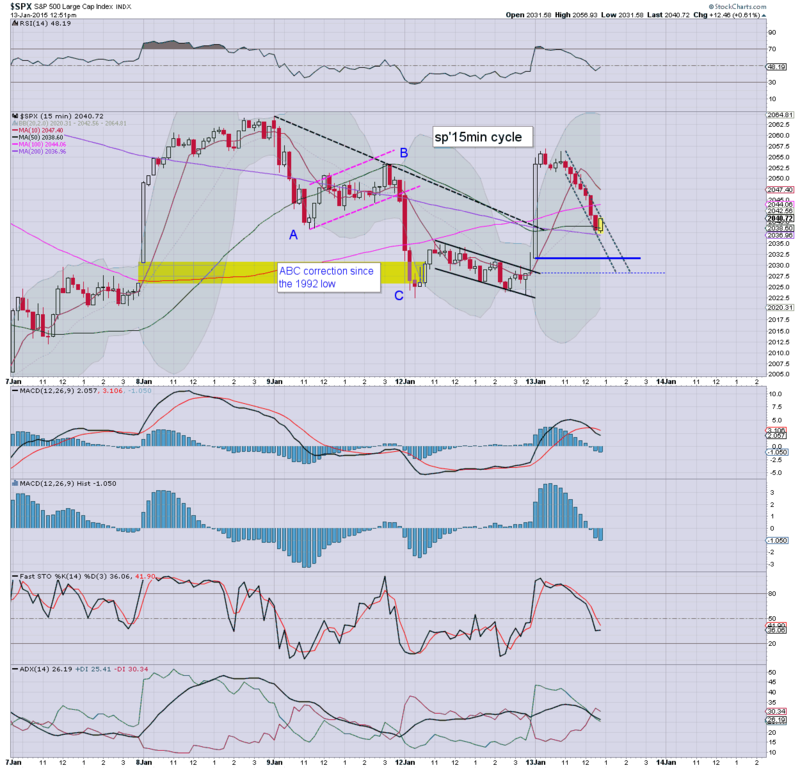 Near term outlook will turn bearish on a break of the 2022 low.. .which is only another 0.2% lower. Frankly, I'm not aware of any particular reason why this market has effectively swung a full 1.7% since 11am, other than straight forward 'selling into strength'. Surprising day. No doubt.. a lot of bears who were short-stopped in the opening 90mins.. are real mad this afternoon. 1.54pm.. HUGE snap lower.. with the loss sp'2022... new low 2013. 2.04pm.. only hope now for the bulls is a turn/floor around 2.30pm... but the damage has been done.. its going to be damn hard to break back above the 50dma in the near term. Oh well.. at least its not boring! 2.16pm... A 46pt swing to the downside.... huge spike-fail seen on the daily charts. 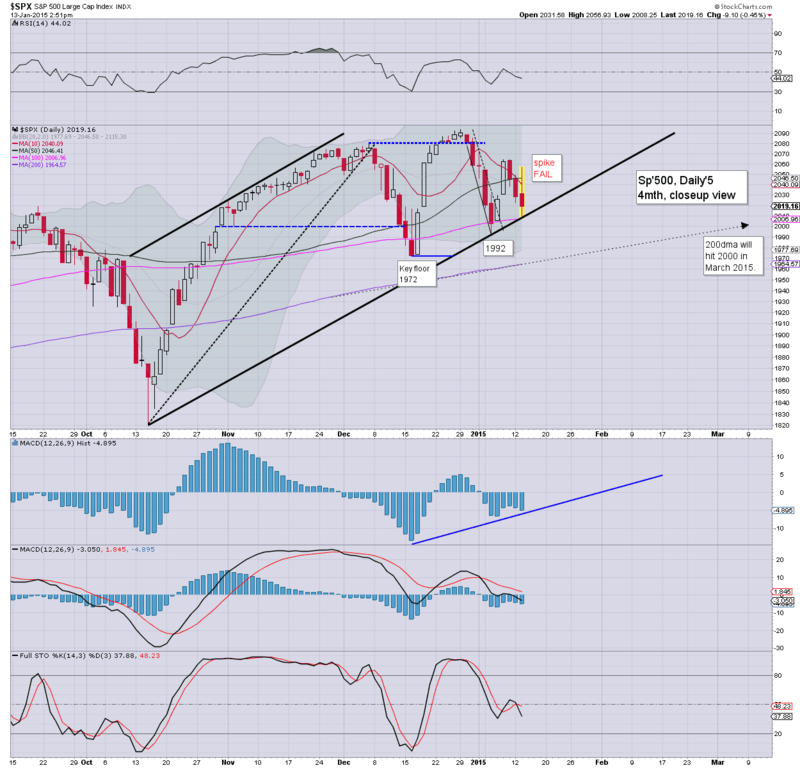 A daily close <2010 (which seems likely)... will open up the 200dma of 1965. 2.30pm.. Well, its typical turn time.... even if we have floored at sp'2008.... the daily charts look terrible now.. and today's price action is about as bearish as it gets. With 90mins to go... a daily close in the 2030s looks just about viable... but still.. that is a long way from the intra high of 2056. US equities continue to weaken... with over half of the earlier gains now evaporated. Equity bulls should be somewhat desperate for renewed strength into the late afternoon, with a daily close at least in the sp'2045/50 zone. ... with the continued weakness... I'm back somewhat earlier. The smaller 15min cycle is offering a hint that market is done with the selling. Overall, bulls really should be clawing for 2045/50 at the close... at minimum. 1.42pm... What a mess.... sp'2024... with VIX 20s. Oil is -1.5%... but that can't be the reason for this complete fail of what were sig' gains. Seen on the smaller 15min cycle.. we do have a likely small bull flag... resetting the smaller 5/15min cycles.. before renewed upside.. whether late today.. or tomorrow. 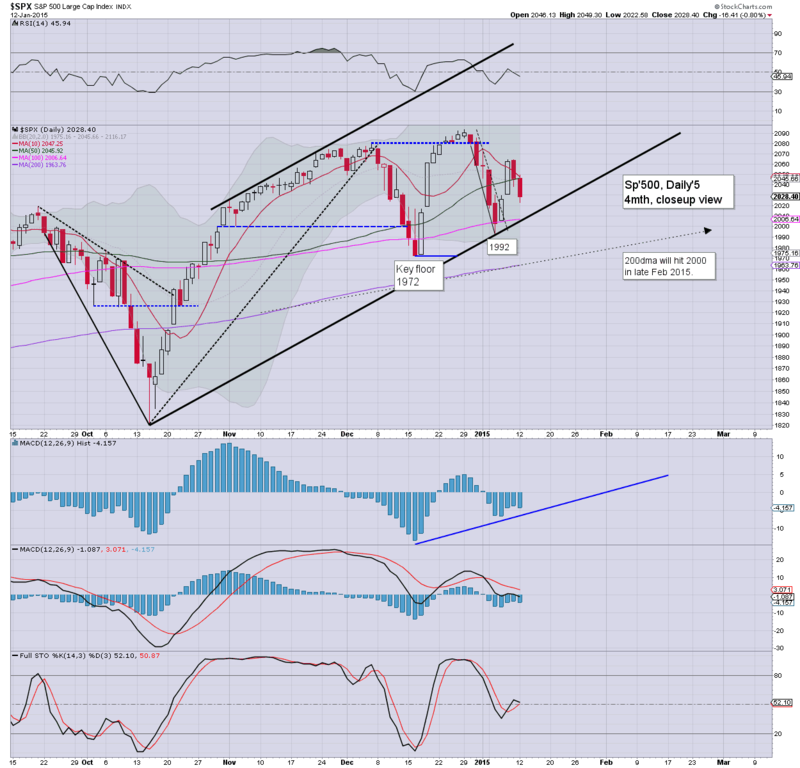 The sp'2100s look due next week. US equities are in minor chop mode, after having built rather significant gains, with a high of sp'2056. 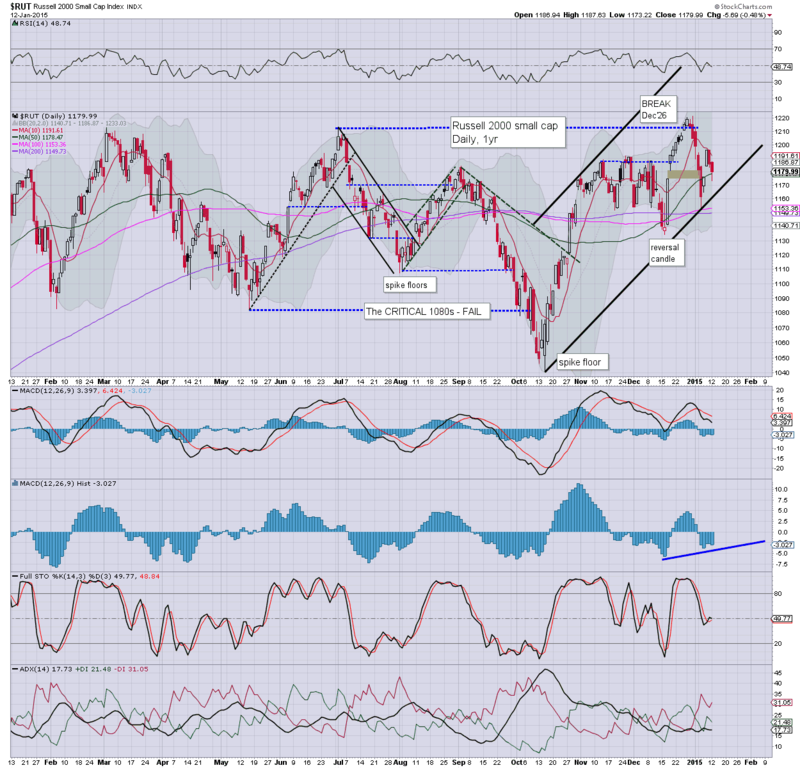 It will be important for the equity bulls to take out the Fri' high of 2064 this week. Metals remain a little higher, Gold +$2. Oil has turned positive, +0.3%, having been lower by -2% in the $44s. 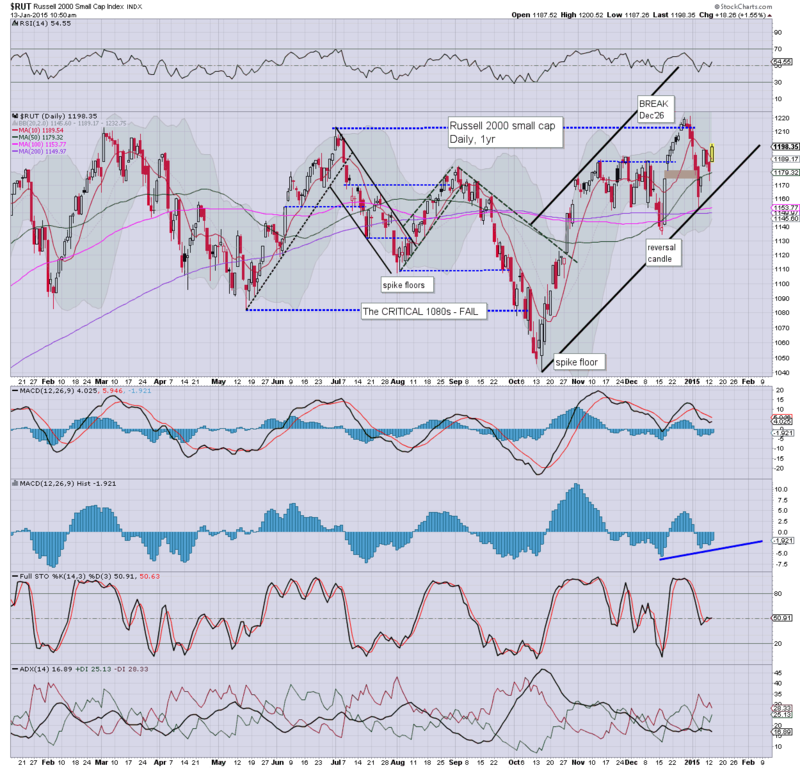 *R2K looks set to be breaking new highs within the next 3-5 trading days. Suffice to say.. this mornings gains are significant, a daily close in the 2050s looks very likely, along with VIX 17s. 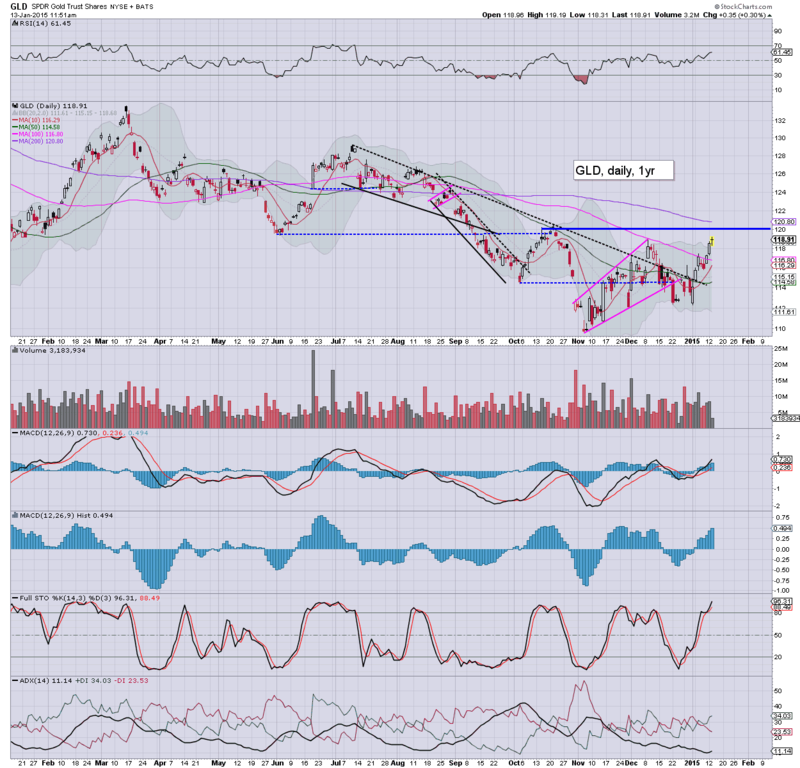 Notable weakness, AA -2.1%.. having posted better than expected earnings. Perhaps they'd have done better if they'd posted a loss? US equities have built significant early gains, with the sp' +25pts @ 2055... a mere 1.9% from breaking a new historic high Metals are looking vulnerable, Gold +$1. Oil is off the lows, but still -1.2%. VIX is naturally cooling, -8% in the upper 17s. So... we're on the rise... the sp'2100s remain a key target. 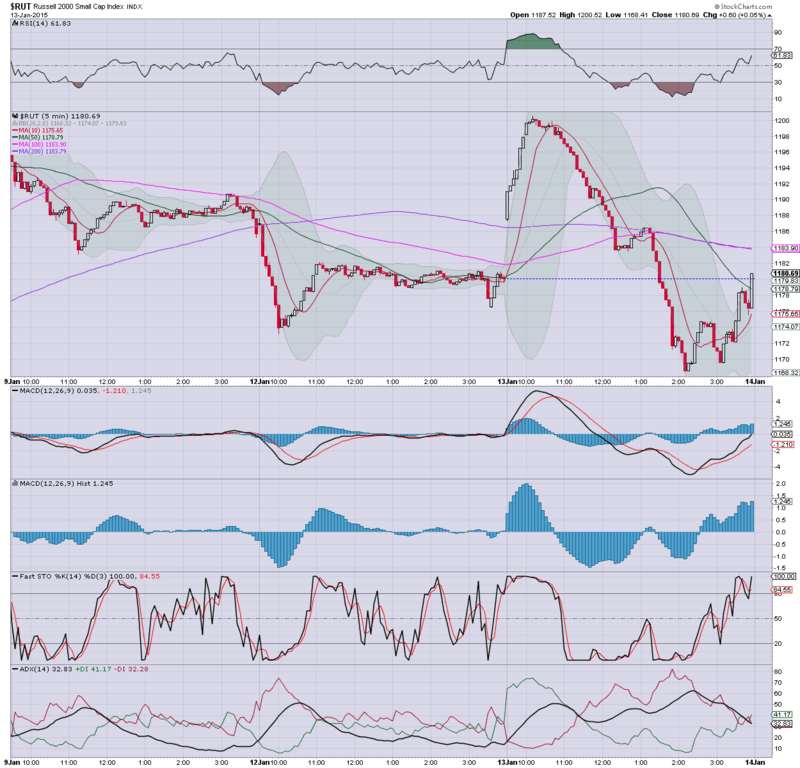 Daily MACD cycle is set to turn positive tomorrow, it does appear that the market will rally into opex/early next week. weakness, copper miners, FCX, TCK, both lower by around -3%. Good morning. Futures are moderately higher, sp +8pts, we're set to open at 2036. 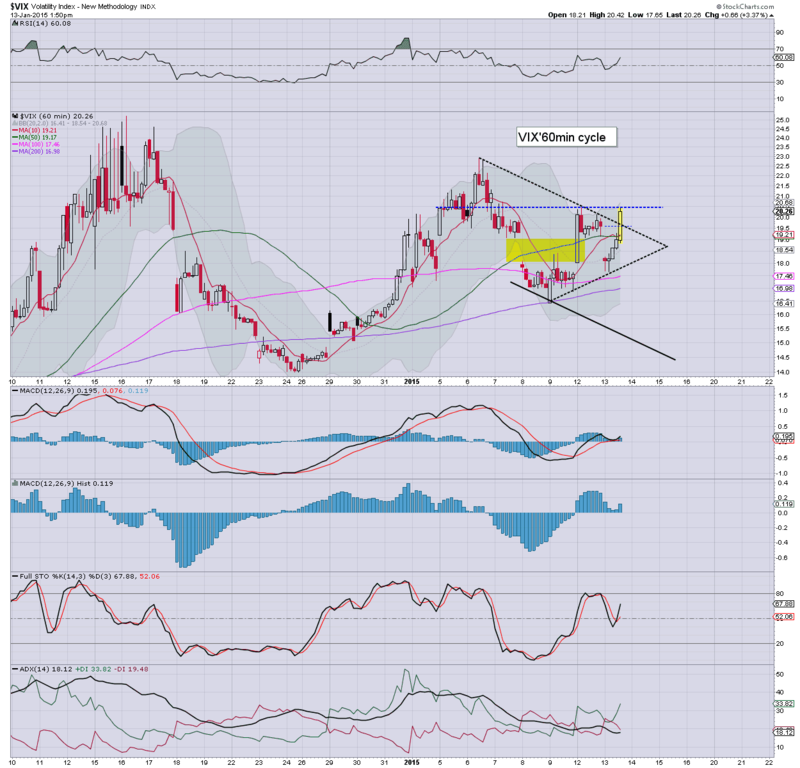 Metals continue to climb, Gold +$6. Oil remains in collapse mode, -2.6%, breaking a new cycle low of $44.20. As the lightning bolts continue to rain down across London city... after earlier glorious winter sun... it looks like the market has a fair chance of building gains this morning. 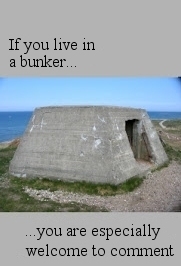 Whether it can hold them though.... is another matter. 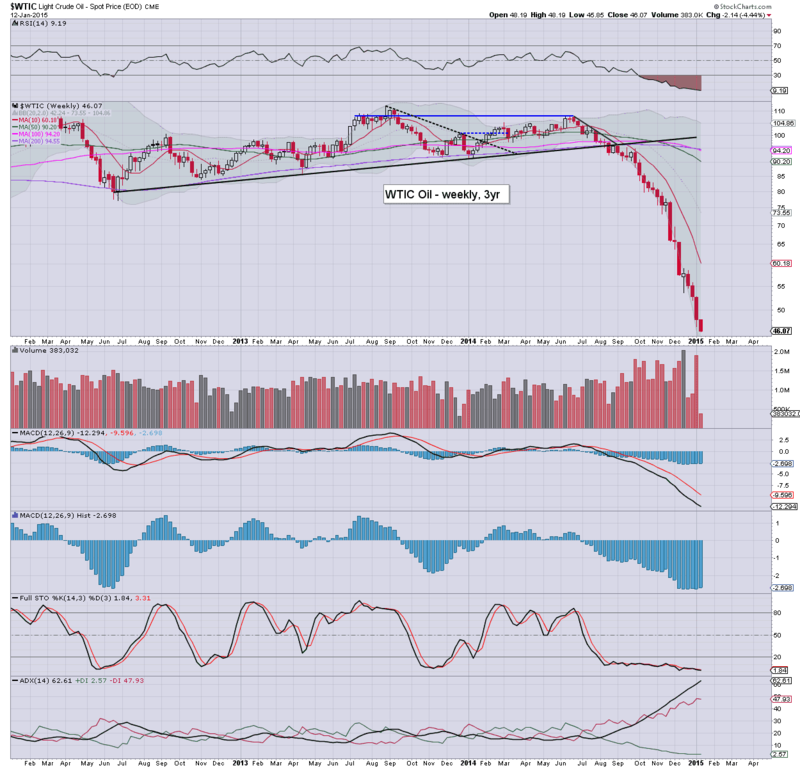 It was just another daily decline for WTIC Oil, settling -$2.14 (-4.4%) @ $46.07 (intra low 45.85). There is clearly no sign of a turn or floor. Next support is the psy' level of $40, after that... the $35/30 zone, where the collapse wave low of Feb' 2009 @ $33.55 is lurking. Clearly, there is no sign of a floor in energy prices, and it won't take much for the Oil market to lose another 15% within the next month or two. Best guess... a key floor is put in by mid summer... at which point the energy stocks will be rather attractive on a 2-3 year perspective. There is nothing due of significance for Tuesday. 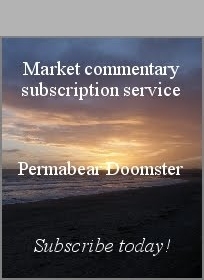 *however, Fed official Plosser will be speaking on the economic outlook at 8am... Mr Market will be listening, and might use any comments as an excuse to gap higher. US equities closed lower for a second day, sp -16pts @ 2028 (intra low 2022). The two leaders - Trans/R2K, settled lower by -0.6% and -0.5% respectively. 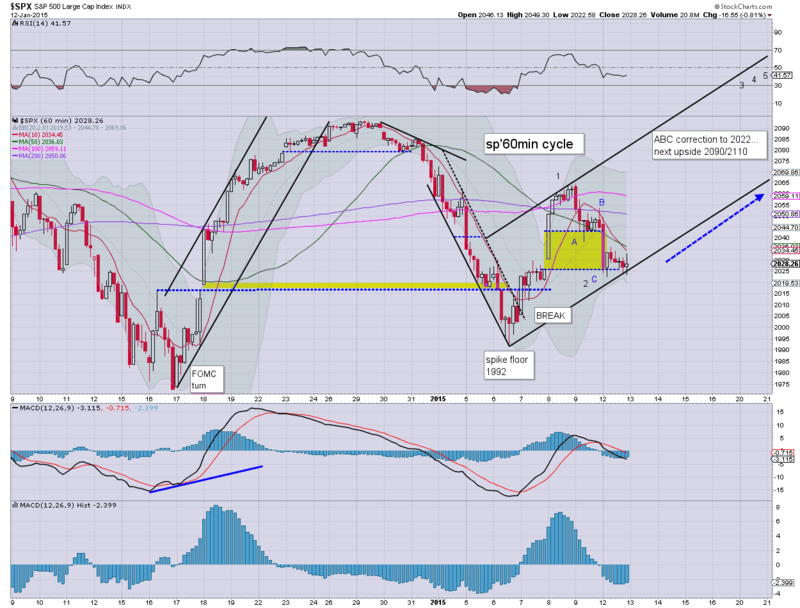 Near term outlook is for renewed upside to the low sp'2100s. Despite a second day of weakness, there doesn't appear to be much downside power.. not least if you factor in the very weak energy sector.